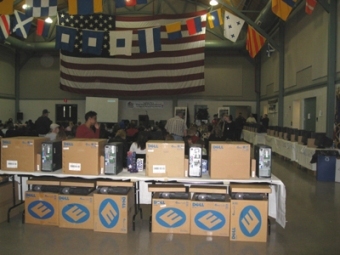 Operation Homelink donates 125 computers to Naval Air Station Joint Reserve Base families. Senior Airman Chris Somers is serving in South Korea and won't be spending Christmas at home with his wife, Tobie, and sons Chase, 4, and Tanner, 1. "The first one he has missed since they were born," Tobie Somers said. "We knew it would happen one day." But he will still share in the Christmas holiday with his family because of a nonprofit organization that provided 125 donated computers to military families at the Naval Air Station Joint Reserve Base Fort Worth. Tobie Somers, who lives in Wichita Falls, said she will connect a webcam to her new computer so her husband can watch the boys open their gifts. He has arranged to be off work when Christmas morning arrives in Texas. "It's fantastic," she said. "He was upset about missing it. It's the next best thing to being here." 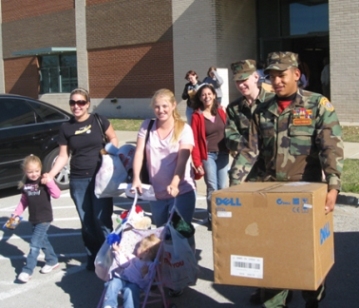 Young Marines volunteers assist Tessa Meinders and her three children with picking up their computer at Naval Air Station, JRB in Fort Worth , TX on Sunday, December 7, 2008. Tessa's husband , Specialist Joseph Meinders , is deployed with the Army's 27 BSB based out of Fort Hood, Texas. 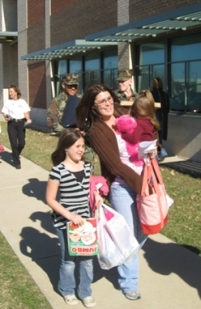 Families drove from across Texas to the event organized by Operation Homelink, a Chicago-based nonprofit organization, and Operation Military Kids, which supports military children. The computers were used but refurbished, so they should work as good as new, said Dan Shannon, founder of Operation Homelink. They were donated by the Waltham, Mass.-based Raytheon Co.
Computers lined tables inside the drill hall at the base Sunday as families arrived. Stuffed animals and other gifts for the children were arranged on other tables. A television played children's videos. April Dean drove from Lubbock with her four children, ages 12, 8, 4 and 21 months. Her husband, Sgt. Chris Dean, was deployed to Iraq in November but has been away from the family since June. "He tries to call home every other day," she said. "This will make it a lot easier. A woman at my children's day care gave us a webcam, so we're going to try to hook it up." Stacy Wade, of Fort Worth, said she has five children in the military. Three of them — daughters Deshanie and Tyreke Wade and son Elijah Gebru — are deployed in Iraq. Another son is going soon, she said. "I'm keeping up on my praying," she said. She already has a computer, but it's old and slow, she said. "It's the Pony Express," she said. "They put updates about themselves on MySpace and, with a better computer, I'll be able to keep up with what they're doing." Tobie Somers along with sons Tanner and Chase, were on hand at the Naval Air Station, JRB in Fort Worth, Texas on Sunday, December 7 to pick up one of 125 computers distributed by Chicago-based non-profit, Operation Homelink. Tobie's husband, Christopher Somers, Support Senior Airman with the Air Force's Operation 51 unit, is currently serving in Korea. Shannon said that television images of U.S. service members departing overseas led him to start the effort six years ago. He wrote letters to the heads of large computer and technology companies asking for help, he said. Raytheon has donated more than 400 computers to the effort. 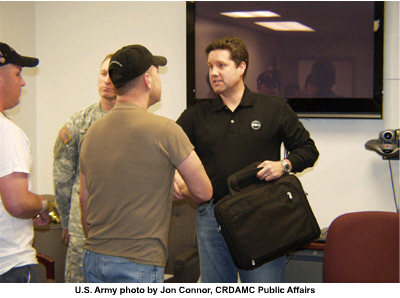 The efforts have expanded to include providing donated laptops to wounded service members receiving treatment in military hospitals and Veterans Affairs centers. 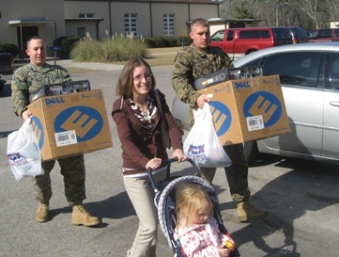 Operation Homelink has provided computers to more than 2,800 military families and service members. "Seeing a father being called to serve saying goodbye to his family really hit home for me," Shannon said. "I wanted to do something to help." 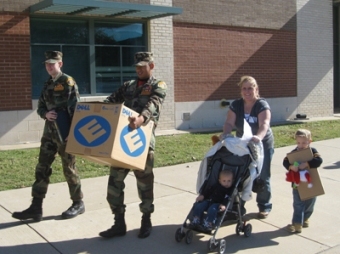 On December 7 th , Operation Homelink distributed 125 refurbished computers were distributed at the Naval Air Station JRB, Fort Worth, Texas, to spouses and parents of deployed members of the Texas and Oklahoman National Guard, Air Force, Army and Navy Reserve units stationed in and around the Dallas Fort Worth area. 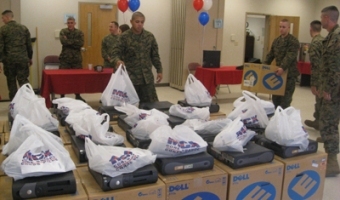 It was like Christmas at Marine Corps Air Station when Operation Homelink gave out 130 refurbished computers. Deploying is never easy for any service member, but through Operation Homelink, one organization is doing their part to help Beaufort Marines and their families during their time apart. It was like Christmas at Marine Corps Air Station today as Operation Homelink gave out 130 refurbished computers to Beaufort Marines and their families who are dealing with a deployment or will be soon. "It is amazing, you have no idea how it touches more than just me, but the family at home," said Sgt. Patrick Wiley. Sgt. Wiley will be deploying to Iraq in March and says without this computer, he wouldn't be able to be in communication with his family the way he'd like to. "They'll get to talk to me and email me and see things," said Sgt. Wiley. "I'll send pictures from Iraq and they can see Daddy, where he's at and what he's doing." While he's away, this technology will allow him to keep up with his children. "They can send pictures to Dad," said Sgt. Wiley. "Dad can show off his kids as they grow up. In six months, he'll be talking and she'll be running faster." This new computer couldn't have come at a better time for Megan Shytle, whose husband is deploying to Iraq in just a few weeks. "Means we don't have to go during library or the community center hours to be able to talk or email," said Shytle. "I don't have to drag my kids out of the house, we can email all sorts of things during the day and night." Not only will this computer be more convenient, but Megan says having reliable communication will help ease her mind while he's gone. "Oh it will be so much better to have this communication especially because with the time difference, he works during the day, and that's night and that's when nothing is open," said Wiley. Knowing how these computers will help these Marines and their families is what the owner and founder of Operation Homelink, Dan Shannon says this mission is all about. "It gives us great comfort to know that we can do this small thing because the bottom line is I personally feel that I owe a debt of gratitude that I can never repay to these people that serve our country," he said. Shannon started Operation Homelink about a year after 9-11 and with the help of corporations donating their computers, his organization has been able to refurbish and give away 2,500 computers to families of servicemen and women. 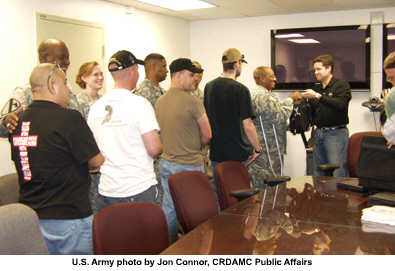 Thirty wounded soldiers received laptops from Operation Homelink and Dell at Darnall Medical Center at Fort Hood, Texas on Dec. 21 st, 2007. Troy West, Vice President of Dell-Federal Sales, presents a laptop to Lesley Mansur, retired member of the 4 th Infantry Division and participant in the Army's Wounded Warrior Program (AW2).